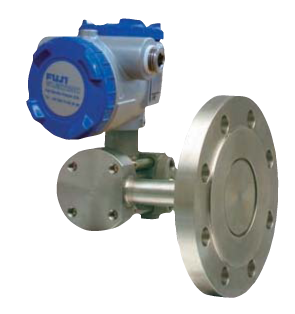 The FCX-AII V5 series pressure transmitters accurately measures and transmits proportional 4 to 20mAdc signal. The transmitters utilize the unique micromachined capacitive silicon sensor with state-of-the-art microprocessor technology to provide exceptional performance and functionality. 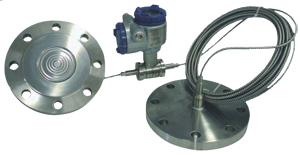 0.065 % accuracy is a standard feature for differential and gauge pressure models and 0.2% accuracy for absolute pressure models. The microcapacitance silicon sensor assures this feature for all elevated or suppressed calibration ranges without additional adjustment. The "Advanced Floating Cell" design which protects the pressure sensor against changes in tempera ture, and overpressure substantially re duces total measurement error in actual field applications. FCX -AII series transmitter offers bilingual communications to speak both Fuji proprietary protocol and HART®. Any HART® compatible devices can communicate with FCX -AII. Burnout signal level is adjustable using Model FXW Hand Held Communicator (HHC) to comply with NAMUR NE43. Thanks to the best combination of unique construction of mechanical parts (Sensor unit) and high performance electronics circuit (Electronics unit), reliability of dry calibration without reference pressure is at equal level as wet calibration.